Apart from Chennai Super Kings (CSK), Mumbai Indians is the only team to win Indian Premier League (IPL) title three times. Over the years, Mumbai Indians’ core players have remained almost the same and that is one big reason for their success. The players have gelled well together and perform like a well-oiled machine. At the auction, ahead of the IPL 2019 season, Mumbai added six more players to their squad. IPL 2019 Schedule in PDF: Download VIVO Indian Premier League 12 Full Timetable With Fixtures, Matches, Team and Venue Details. MI’s picks at the auction was a good mix of experience and youth. The Mumbai-based franchise picked Lasith Malinga, Yuvraj Singh and Barinder Sran and part from them added few new faces to the squad as well. 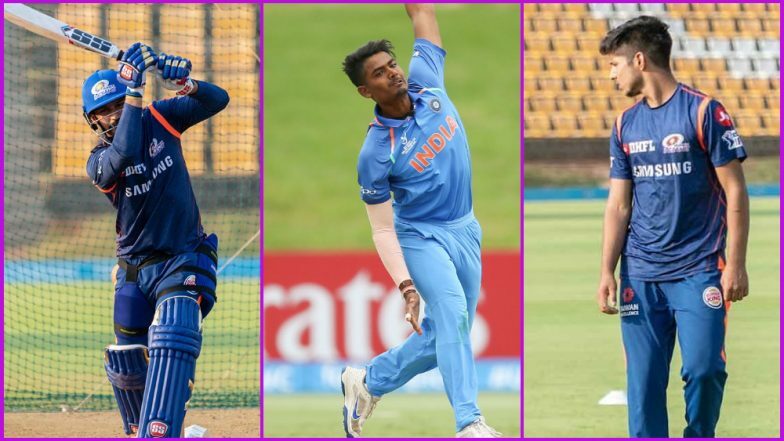 Ahead of the IPL 2019, we take a look at some upcoming talent in the MI squad. Anmolpreet Singh: Mumbai Indians picked the 20-year-old batsman for INR 8o Lakhs. Anmolpreet, who hails from Patiala, is known for his big hitting ability and will be handy for the three-time champions. Mumbai Indians Squad in IPL 2019: Team Profile, Schedule of MI in VIVO Indian Premier League 12. Rasikh Salam: Mumbai Indians have added 17-year-old pacer from Kashmir in their squad as well. After being picked by Mumbai Indians, Rasikh made his T20 debut for Jammu and Kashmir in the recently concluded Syed Mushtaq Ali Trophy. Known for his speed, Rasikh in five matches picked four wickets. Anukul Roy: The 20-year-old all-rounder was with Mumbai Indians squad last year as well but missed out on making his debut. At the U19 World Cup in 2018, Anukul dished out some impressive performances with the ball. Mumbai Indians Tickets for IPL 2019 Online: Price, Match Dates and Home Game Details of MI in Indian Premier League 12. Mumbai Indians were crowned IPL champions in 2013, 2015 and 2017. Last season, the Rohit Sharma-led side failed to qualify for the playoffs and finished fifth on the points table with six wins from 14 matches.